Each of us is constantly in a battle—with gravity! A frequent casualty is the soft disc material that separates each spinal bone. Pressure from our weight, trauma from an accident and other causes can increase the pressure on a weakened disc. Spinal decompression can help. This highly advanced treatment is noninvasive and has been found to provide relief of back and neck pain and symptoms associated with herniated discs, bulging discs, protruding discs, degenerative disc disease, posterior facet syndrome, and sciatica. 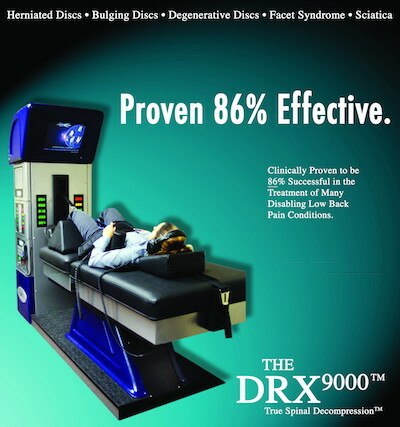 Leading Hilton Head Island chiropractor, Dr. Brad Fraum, and his team of experienced doctors have had extensive post graduate training on the DRX9000™. This state-of-the-art technology has been researched and approved at John Hopkins University, The Mayo Clinic and Duke University of Medicine. So, what are you waiting for? Say goodby to back pain – call (843) 681-7777 right now!